The popularity of SBS’s Wednesday and Thursday drama Deep Rooted Tree has been increasing, and the sales volume of the novel, which the drama is adapted from, has also been surging. In fact, the potential of Deep Rooted Tree historical drama, which centers around the mystery of Hangul creation, to surge past 20% ratings have became a topic of discussion. The drama is produced from the original work of same name by novelist Lee Jung-Myung, which had sold 700,000 copies between the time it was published at 2006 to July 2011. This time the popularity of the drama increased together with the care for the book, sales volume has started to increase quickly again. The Korea’s publisher association revealed that before the TV series production, the sales volume and ranking of the book was negligible. A end of September, one week before the debut of the TV series, the overall ranking for the book is 44th, and the rank was raised to 22nd on October 5th. At the second week when episode 3 and 4 were aired, the rank had surged to 7th place. 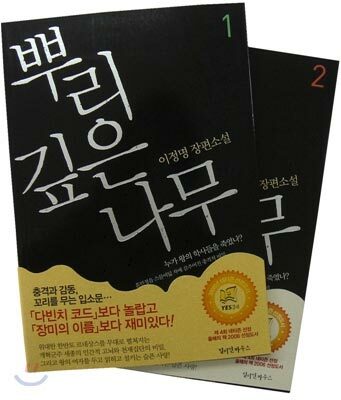 Not only it ranks sixth in the Kyobo bookstore, on online bookstore it has returned to rank within top 10 again. In the fiction ranking in South Korea, Deep Rooted Tree ranks the second after “The Crucible” (도가니). On the category of all novel, there is not much different, it ranks at the third place right after “O Aleph” (알레프), a new work by Paulo Coelho, showing its potential. On the other hand, another novel by Lee Jung-Myung, “Painter of the Wind” (바람의 화원) had also seen its sales increased with the with drama directed by Jang Tae-yoo, and now the destiny also let his another book enters into the most pouplar book ranking chart by virtue of the good reputation enjoyed by the drama.